Starring Ava Gardner (Maria Vargas), Humphrey Bogart (Harry Dawes), Edmond O'Brien (Oscar Muldoon), Warren Stevens (Kirk Edwards), Rossano Brazzi (Count Vincenzo Torlate-Favrini) and Marius Goring (Alberto Bravano). "When I was a little girl, like so many others there was no money to buy shoes for me. And when the bombs came, in the civil war, I used to bury myself in the dirt of the ruins to be safe. I would lie there, safe in the dirt and wiggle my toes and listen to the noise and dream of someday being a fine lady in fine shoes. I hate shoes, Mr Dawes. I wear them to dance and to show myself but I feel afraid in shoes and I feel safe with my feet in the dirt." Spoken by the central character in The Barefoot Contessa, Maria Vargas is a flaming-hot flamenco dancer who, on the eve of her ascendancy into film stardom, is content to walk barefoot on the grimy side of life when it suits her. The problem is, it suits her just about most of the time. 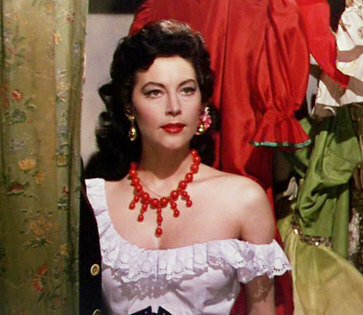 When I first saw Ava Gardner as Maria Vargas, I was intrigued by her characterization. 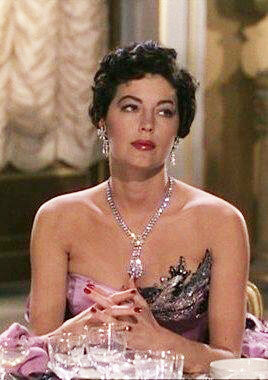 Here was a movie star that seemed indifferent to all the glamour, excitement, and attention that stardom had to offer. 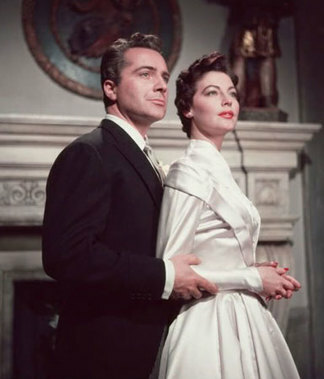 Director-Writer-Producer Joseph A. Mankiewicz's The Barefoot Contessa came off at the time as just another big-budget Hollywood glamour showcase for his top star. Yet there was something about the film that left me dissatisified, something I couldn't - at my young age - put my finger on. I would revisit Maria Vargas throughout my life, snatching a respite in the fabulous fashions and cynical dialogue. That was over fifty years ago, and now, seeing it through a different lens, I ask myself, "What if this film, shot in the bloated tones of TechniColor, is masquerading as a noir statement? And what if Maria is both tough guy and reluctant femme fatale?" Clues pointing to this noir relationship exist everywhere: from the flash-back narration of the three male characters, to her moody outlook on life, to the thread of fatalism from just about everyone in the room - and let's not forget a perfectly executed noir ending - bleak, sorrowful and with plenty of rain. Suddenly, The Barefoot Contessa makes perfect sense, as Maria and all the men in her life - Harry Dawes, Oscar Muldoon, Kirk Edwards, Count Torlate-Favrini and Alberto Bravano - represent a dizzy interplay of the greater philosophical views of Camus, Sartre, Nietzsche and Kierkegaard. "I have gowns and jewels of silver and gold...I have a coach not pulled by four horses but with the power of 200...Thousands of men write each month that they dream of me...Mothers give my name to their babies and young girls rub their faces with the soap which I am paid to say I use, but which I do not. And I have so many other things - Everything in the world which can be rented." But of course, Maria's answer to her angst is in the arms of a rough character of the night, because - as she explains, "I have a sort of sickness when it comes to men”, choosing only brutish fellows from the streets who want to use her. Maria's only friend and confidante is her compassionate director, Harry Dawes, played by Humphrey Bogart. Dawes is the soft existentialist, whose optimism is just realistic enough to accept that he's chained to corrupt men within the business that is Hollywood. Yet, somehow he manages to keep his self-respect, dignity and a sharp sense of humor - a Camus in the closet, it seems. He struggles with Maria to cast off her moody men and lifestyle, urging her to create something more positive, but what is she supposed to trade them in for? The stage is set for Maria's final act against the glittering world of the Rivera, where the political fallout of WWI and the Cold War paranoia seems to cast a pall on everyone up and down the wealthy coastline. Royalty and rogues alike are bored and indifferent to even the addictive temptations of gambling and whoring around. Maria paces through the lush environment of casinos and mansions like a restless animal, whose primal instincts urge her to seek another kind of excitement on the other side of the tracks. Once there, she's perfectly at ease in the netherworld of urban nomads and small-time grifters; partially because their grim indifference is more comforting than the contrived artifice of Hollywood, where she can feel more in control of her life, if only for a few moments. There's a bitter irony here that a woman such as Maria - a woman who is used to traversing the dark world of brutish men in dark stairwells - is emotionally unprepared for the tragedy that surrounds her new husband, Count Torlate-Favrini. Played with a cryptic bluntness reserved only for European actors, Rossano Brazzi offers a sharp contrast to Maria's fall into girlish love, as she prattles joyfully about her “prince”, unaware that his desperate selfishness for her traps them both in a gossamer nightmare of inevitable doom. Nominated for Best Original Screenplay by the Academy, the tough-talking dialogue appears at odds with the opulent fashions designed by the House of Fontana. Edmund O'Brien won a Best Supporting Oscar for his memorable portrayal as Oscar Muldoon, a fast-talking Hollywood huckster, who is bewildered by Maria's stubborn refusal to just count her blessings and enjoy the ride. The Barefoot Contessa is a unique - if deeply misunderstood - film that acts as a bridge between the cinematic noir of the 1940s/1950s and the Neo-Noir films of the 1970s. The classic film noir genre borrowed from the detective and pulp markets of the 1930s, attempting to make sense of a world undergoing drastic social and political global changes. Yet, this existential artistic expression gave way to the Neo-Noir sub-genre - a more uncompromising movement that extended this world view through the prism of extreme nihilism. Films like The Grifters, At Close Range and Reservoir Dogs may bear no remote resemblance to Maria's story, but the seed of her dread and anguish are there for those who care to look more closely.